If you are on the search for your wedding photographer then this is one post you need to read. It’s a fantastic guest post by the very talented photographer, Rebecca Douglas, who is going to give you the low down on what you need to look for when booking your wedding photography. Let’s find out more from the gal herself……. Rebecca Douglas – In front of the camera for once! Start by asking yourself some simple questions. What’s your style? Do you like traditional, documentary, modern and edgy or retro and vintage? What do you want captured on the day? Is it from arrival at the ceremony until the last dance, longer or less? Do you want an album or DVD only with all of the images, or both? What is your budget? Photography is the only lasting reminder of your day so think carefully about what have you budgeted. Is it realistic? Start by searching for photographers on Google and look at review websites, blogs and social media. If you see a photographer you like what is your gut reaction to their images? Do you love, like or just think ok? You should LOVE LOVE LOVE! Draw up a short list of possibles, then try pinning their images (Pinterest is a great research tool) and keep comparing. Contact them to see if they are free on your wedding date. It’s also a good chance to see what their speed of response is like. Are they efficient and good at getting back to you as the customer? Can you see yourself in the images? Are the key moments captured? Are the images sharp? Do the images look well lit? Do the people look comfortable and relaxed? Are the images taken from flattering angles? Hint: all the answers should be YES! When you meet with the photographer have a checklist of questions that link to your list of priorities. It’s also important that you strike up an instant rapport and you’re happy that they are focused on you and your day. Lastly you need to do a bit of admin! Make sure your photographer has public liability and public indemnity insurance as well as professional (full-frame cameras) and back up gear. Read their terms and condition carefully. Also check they have back up on and off site for images so they are not lost forever! It’s also helpful at this point to see what images you will get (how many and what resolution) and your rights to print and upload. It’s worth asking how they will use them and will they Photoshop and edit images, plus you need to find out how quickly you will get the images and/or albums after the wedding. It’s really important too that you can see yourself smiling at your photographer for the whole of your wedding day and you are super comfortable with them. If so, the experience will be so much more enjoyable especially if you are a bit camera shy. 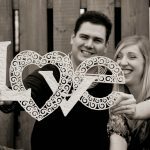 It’s also a great idea to have an engagement shoot to get comfortable as a couple in front of the camera and work with your photographer prior to the day. Massive thanks Rebecca and if you’re just starting out on your wedding planning, we cover how to pick your suppliers in our workshop so take a look here for more info.